Vegetarian Faerie In The Kitchen. : Delicioso Simple Green and White Pizza! Delicioso Simple Green and White Pizza! Pizza. I ate it in Milan once. Pizza. It was the best in Milan. Pizza. I made a Spinach and Cheese Sauce one. Pizza. I don't think this one is very authentic. Pizza. It's pretty good anyway. I have a problem with pizza... I eat a lot of it.. but that's not the main problem.. The main problem is how much I put on top of it! This is the most restrained pizza I have ever made! Muffin ate it and said "See? SIMPLE! DELICIOUS!" He was amazed I could put anything LESS than 6 toppings on it! Melt butter over a medium heat, add flour and whisk together. Add 1/4 cup milk and whisk quickly to remove lumps. Add in the rest of the milk and whisk. Turn heat to high and add the cheddar cheese and vegeta. Once sauce has thickened (about 5 mins), add cream cheese and corn flour. Mixture should be thick enough to spread - keep in mind it will thicken more once cooled. In a big bowl, add spinach, onion and vinegar.. Season with salt and pepper. In a frying pan, fry mushrooms until softened and brown. Add to spinach. Flash fry chinese greens. Add to spinach mix. In a small pan over low heat, melt butter and add garlic. Turn heat off and leave to sit while you prepare the dough. Take 1 handful of dough and roll out on a floured surface, into a 6 inch circle. 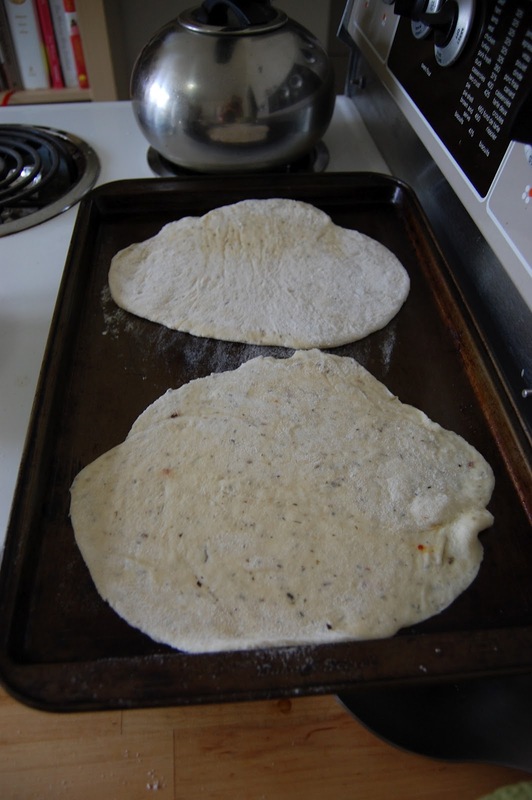 Place dough on baking tray. Take a pastry brush (or teaspoon) and brush the garlic butter around the crusts. Spread 1-2 Tablespoons cooled cheese sauce on to pizza bases. Add 3/4 cup green vegie mix and spread out evenly. Serve sprinkled with shredded basil and diced tomato. Wow, that pizza would've tasted delish and full of superfood goodness! Thanks for sharing, going to give this one a try. :) I love pizza too!